« We Trashed The Health System For A Supposed 5 Million Enrollments? Of course, pretty much everything of Mankind’s is Bad for climate change, according to Warmists. Gumball Brains emailed me a picture the other day, showing that Pirate’s Cove appears on a map in the Lego Movie. What are Lego’s made from? ABS plastic, which includes coal and petroleum hydrocarbon, so, yeah, fossil fuels, bad for climate. And your bare feet if you step on them. You thought your pot came from environmentally conscious hippies? Think again. 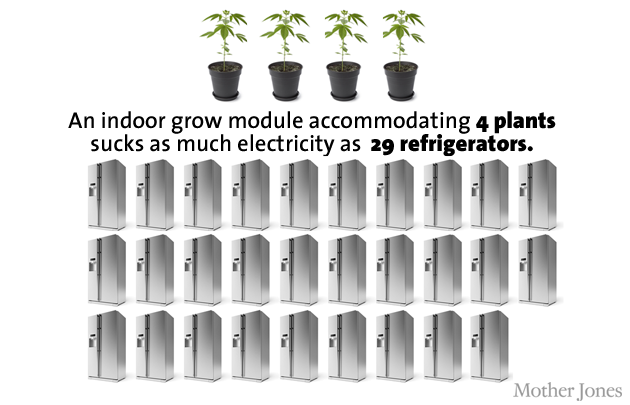 The way marijuana is grown in America, it turns out, is anything but sustainable and organic. Remember, fridges, especially those with ice makers, are bad, too, because of electricity usage and the coolants. That’s a lot of energy, hence, bad for “climate change”. Uh oh. 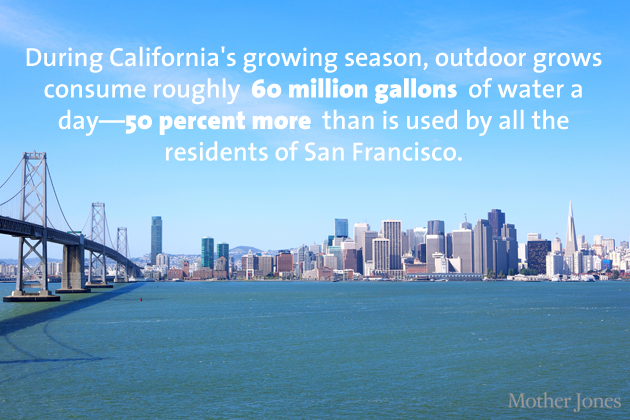 Big “carbon footprint”. That’s the equivalent of 2.087 metric tons. The average world CF is 4 metric tons. People in third world nations average around 2mts. Tsk, tsk. Pot growing in the US is also equivalent to driving 3 million cars yearly. 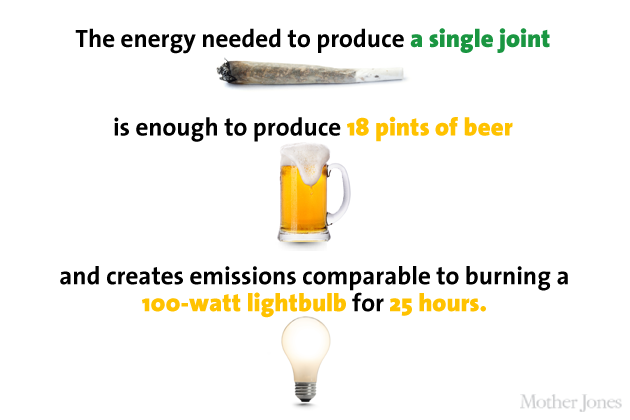 And, of course, beer is also bad, because it contains CO2 and produces CO2 during the fermentation process. And that looks like an evil incandescent light bulb! So, essentially, states that allow marijuana use are Bad for “climate change”, especially Colorado, and, according to Warmist doctrine, everyone should be arrested and thrown in jail. This entry was written by William Teach and posted on at 9:27 am and filed under AGW Idiocy, Global Warming. Bookmark the permalink. Follow any comments here with the RSS feed for this post. Most activities that require external energy inputs emit significant CO2 – this includes transportation, grow-lights, spreading fertilizer, pumping water, heating, cooling, etc. 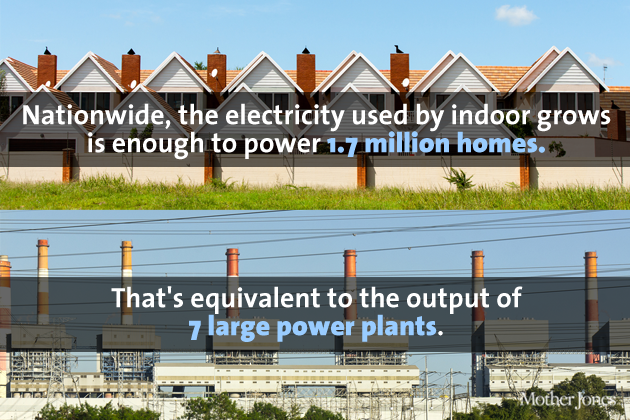 To slow global warming we must reduce our emissions of CO2 from these residential, industrial and agricultural sources. This means we need to find alternative energy sources, i.e., that do not emit CO2 or that emit significantly less CO2. Examples are nuclear, solar, wind, natural gas (as a short term transition) generated electricity. Increased efficiency in the use of current energy sources can be of significant help. Fermentation adds little to atmospheric CO2. Nor does animal respiration. There is no “warmist doctrine” that would throw people in jail for CO2 emissions. Serious climate realists prefer a workable market solution to reducing CO2 emissions, such as a carbon cap-and-trade system or a carbon tax. Why is it your goal to spew disinformation and actually reduce the intelligence of your audience? First, it’s cute how you’re trying to abrogate the phrase “climate realists”, which has already been taken by us “skeptics”. Second, it’s interesting that your want Everyone Else to be forced to do something for your beliefs, yet you refuse to change your own behavior. Why is that? And, really, if you take umbrage with the article, take it up with Mother Jones, not me. That is a fairly heavy energy foot print for Pot growing in the USA. 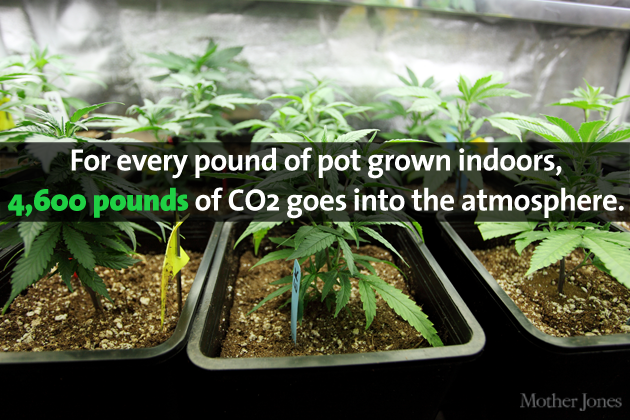 And that does not consider the smoke and CO2 pollution from the use of Pot a lot of which is a foreign import. I hope the taxes on Pot in WA and CO are at least equal to the tobacco taxes. (disclaimer: I don’t smoke) Did those two states add a “carbon tax” to those recreational /luxury products? Jeffery; I understand that the carbon tax and cap and trade market is to either change carbon use behavior or offset carbon use behavior. Serious question: I see proposals for the taxes, but I hardly ever see what uses all those taxes will be used for. I don’t hear proposals from the politicians that those taxes will be dedicated to efficiency, generation, CO2 sequestration, etc. Taxes for the sake of taxes or for behavior modification is a non starter for me. If behavior modification is the goal, where are all the behavior specialists — psychologists, sociologists, economists, etc. — proposals to get people to willingly change and accept a different life style? All the proposals I hear are the use of force and govt. pressure. Both of those breed resistance and black markets like Prohibition and drug war. Subsidies can help but they have to be crafted very carefully or they are taken advantage of and behavior does not change. Leadership is the best model for behavior change. The parable of the lightbulb: How many psychiatrists does it take to change a lightbulb? Only one, but the bulb must want to change. The so-called ‘skeptics’ are not skeptics but deniers. Scientists are skeptical by nature. The so-called skeptics are not. The reality is that the Earth is warming – hence, the actual climate realists – and you deny the truth because of ideology. Haha… you’ve already ‘taken’ climate realists. That’s funny. You have 2 lies in one sentence. I do not want to force Everyone Else to be forced to do anything. You have no idea what my behavior is, do you? Why you fantasize about my behaviors I’ll never know. The Mother Jones article was factual. Why would I take umbrage with them? The so-called ‘skeptics’ are not skeptics but deniers. Scientists are skeptical by nature. Ya gotta love that lack of logic and thinking. I do not want to force Everyone Else to be forced to do anything. Tell us all Jeffery, do you think that “carbon cap-and-trade system or a carbon tax” would be voluntary? If so, why aren’t you implementing a carbon tax within your company and your own life? You have no idea what my behavior is, do you? We keep coming back to the fact that you have written in the past how wonderful your life is and how you use fossil fuels. Now I realize that you have a problem remembering what you have written and said in the past, but there are those of us who do. Really? Isn’t that what cap and trade, carbon permitting, and all the other rules and regulations about? Consider the incandescent lightbulb “ban”: it forces everyone to comply because a bunch of people were concerned (yes, this includes some idiot Republicans), and damaged an industry. Cost jobs. Not climatologist ones. But, then, they aren’t really scientists, more like high priests.